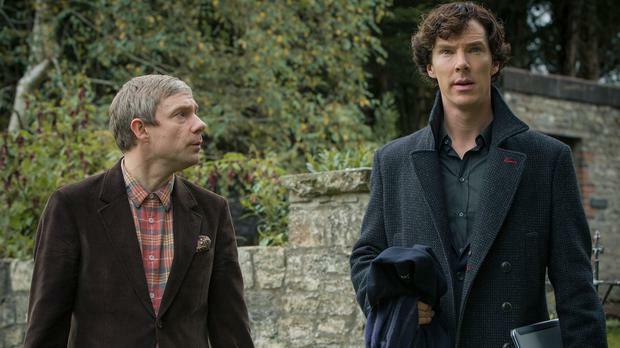 Sherlock's Martin Freeman has eclipsed his co-star Benedict Cumberbatch after he was nominated for two Emmy awards. The star, nominated for his role as Dr Watson and for his work in US mini-series Fargo, is one of a host of UK stars among the nominees announced today. His performance as Lester Nygaard in Fargo, based on the hit film of the same name, sees him nominated for Outstanding Lead Actor In A Miniseries Or A Movie. The other nominees include Benedict, nominated for Sherlock, Chiwetel Ejiofor who is nominated for the BBC drama Dancing On The Edge and Idris Elba for Luther. Also in the running are Mark Ruffalo and Freeman's Fargo co-star Bi lly Bob Thornton. Martin's performance as Watson sees him pick up another nomination - for Outstanding Supporting Actor In A Miniseries Or A Movie - where he faces competition from names including Fargo's Colin Hanks and Alfred Molina. Comic Ricky Gervais is nominated for Outstanding Lead Actor In A Comedy Series for Derek alongside names including The Big Bang Theory's Jim Parsons and Episodes' Matt LeBlanc. The event, formally known as the 66th Primetime Emmys, also sees a nomination for Downton Abbey star Michelle Dockery who is up for the Outstanding Lead Actress In A Drama Series gong along with Homeland's Claire Danes and Robin Wright from House of Cards. Robin's co-star Kevin Spacey is nominated for Outstanding Lead Actor In A Drama Series alongside two of the stars of True Detective, Woody Harrelson and Matthew McConaughey. Another two Downton Abbey stars, Dame Maggie Smith and Joanne Froggatt, are in the running for Outstanding Supporting Actress In A Drama Series along with Game of Thrones actress Lena Headey. Jim Carter, who plays the butler Mr Carson in the ITV period drama, is nominated for Outstanding Supporting Actor In A Drama Series but faces competition from Peter Dinklage who plays the wily Tyrion Lannister in Game of Thrones. The bloodthirsty fantasy show got 19 nominations - more than any other show - including a nod for Diana Rigg who plays Lady Olenna Tyrell, while US star Paul Giamatti's appearance in Downton Abbey sees him nominated for O utstanding Guest Actor. H elena Bonham-Carter's portrayal of Elizabeth Taylor in BBC biopic Burton and Taylor see her nominated for Outstanding Lead Actress In A Miniseries Or A Movie with Minnie Driver and Jessica Lange, while Steven Moffat's work on Doctor Who sees him nominated for Outstanding Writing for a Miniseries, Movie or a Dramatic Special. There are also nominations for filmmaker Stephen Frears, presenter Cat Deeley and Hillsborough - a documentary made about the disaster for sports broadcaster ESPN - could win the award for Exceptional Merit In Documentary Filmmaking. The awards will be handed out at a Los Angeles ceremony on 25 August 2014. Downton Abbey's executive producer Gareth Neame said he was thrilled with the show's 12 nominations, including nods for best drama, direction and costume design. He said: "It is the members of the TV Academy that helped turn Downton into a global hit and we'll never forget that."